With a roaring campfire, glittering pines and a classic pup tent, this personalized Camping ornament is pure delight! 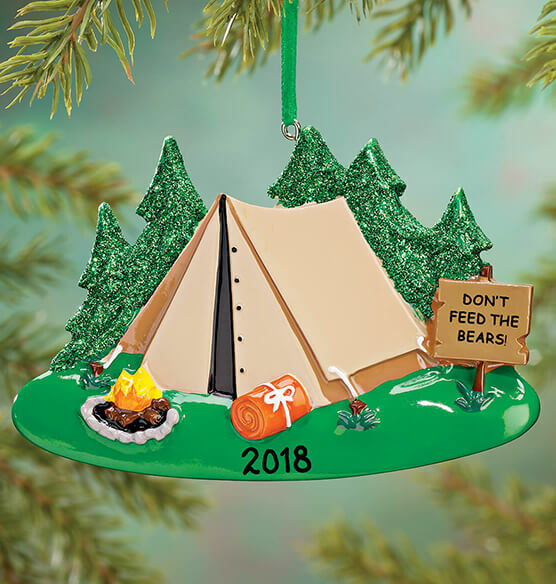 A keepsake treasure for campers of all ages, our Christmas ornament will bring back memories of a past camping trip, announce a future getaway, or simply celebrate a favorite pastime. We'll personalize with name, message or memorable year for even s'more fun! Specify name/message/year; limit 1 line, 12 letters/spaces. "Don't feed the bears!" is standard. Resin. 4 1/2" wide x 3" high. I am giving this as a Christmas gift. It looks great! The ornament has so much detail and looks realistic. This is a little gift for my daughter-in-law. Stocking stuffer! Adorable ornament - my great-grandson loves it & loves camping! the camping ornament is even better than I expected. I ordered it personalized and it came within a few days. the colors are bright and vibrant and my grandson's name on it makes it even more special. he is gonna love it! This was an add-on Christmas gift for my grandson. He is in Boy Scouts and does go camping, for sure. I tied this onto the bow of one of his packages, He really liked it a lot, and went and hung it on their tree on Christmas Eve. It looks great and is excellent quality.